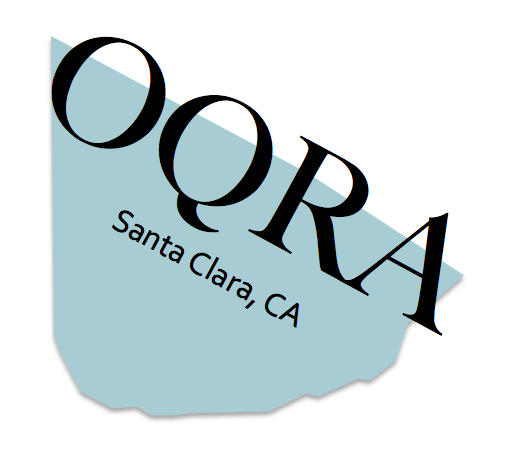 Santa Clara's Old Quad Residents' Association (OQRA) is a community organization of residents, businesses, and others concerned with keeping the Old Quad a wonderful place to live, visit, and do business. What is Santa Clara's "Old Quad"? The name Old Quad is derived from the quadrangle shape of the original Town of Santa Clara, as seen in the first town survey made in 1866 by J. J. Bowen. Geographically, the Old Quad is the area enclosed by Scott Boulevard to the west, Newhall Street to the south and east, and the railroad tracks to the north and east. The shape in our logo is the shape of the Old Quad. Yes -- it's a little triangular, but it's always been called a quadrangle, so we'll go with it. Is the Old Quad an historic district? The City of Santa Clara does not currently officially recognize the Old Quad as a "historic district"; however, the area is filled with historic buildings, landmarks, and stories about the beginnings of Santa Clara. What is the history and purpose for OQRA? The Santa Clara Old Quad Residents’ Association (OQRA) was founded in June of 1979 to improve the physical appearance of the 125-year-old neighborhood. Since then, its purpose has been to preserve the substantial historical heritage, host social events that bring about a strong sense of community spirit, and promote a high-quality environment for all. In 2014, several residents, new and old, have come together to grow membership and re-energize the group. Restoration and rehabilitation of the neighborhood's older homes. Ensuring any new developments are of the highest quality, compatible with the existing architecture, and provide for the areas needs. OQRA also seeks to nourish the strong sense of neighborhood and belonging present in the Old Quad, via social gatherings, neighborhood group efforts, and publication of an informative newsletter. How does OQRA accomplish its goals? Monitoring City Council & Planning Commission actions pertinent to the Old Quad. Working together on improvement projects such as tree plantings or building restoration. Hosting social events that benefit local charities and build community spirit. Conducting historical walking tours highlighting sites of historical interest. Researching and advocating for various improvements such as the addition of necessary services like grocery stores and gas stations, the placement of historical plaques, improvements to parks or libraries, etc..
Recognizing outstanding contributions to our neighborhood's revitalization and preservation. If you have a concern or question for the Board of Directors, please email us. How can I get involved with OQRA?